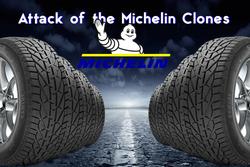 For the 2018/2019 winter season the Michelin Company conducts large-scale offensive at the marketing front. Adopting time-tested tactic of the same tire tread cloning the French concern has produced five new models under budget subsidiary brands. In the first episode of attack of the clones using «copy&paste» technique Michelin had produced 13 high performance summer models, meanwhile in the second episode 12 winter models for SUV, and, as for third episode, they had developed 6 summer tires of «touring» class. This time it has come to modernization of the winter assortment brands such as Orium, Strial, Taurus, Riken, Tigar and Kormoran. That is intended for motor cars. Once again Michelin has gone to the path of least resistance and the used for six allegedly new models the tread pattern that we have already met due to the package of «Dolly the sheep» presented last year: Riken SUV Snow, Kormoran SUV Snow, Tigar SUV Winter, Taurus SUV Winter, Strial SUV Winter and Orium SUV Winter (friction), also Riken SUV Stud, Kormoran SUV Stud, Tigar SUV Ice, Taurus SUV Ice, Strial SUV Ice и Orium SUV Ice (studdable). In this, it should be noted the method, with which the Michelin company has decided to distinguish. Another manufacturers use only one tire tread, as a rule, firstly producing passenger model, and only then tires for SUV with higher standards for construction and with prefix SUV in the name. As for Michelin, it all did the exact opposite. One would like to separately emphasize mismatch with the names of models. The new winter tires of the Riken and Kormoran brands, based on the logic of names Riken SUV Stud and Kormoran SUV Stud, would have had to be called Riken Stud and Kormoran Stud, but the model with these names have long excited. As a consequence, Michelin marketers had to add two to these brands. Summarily the army of Michelin clones already has 43 models, and such deliberately amendment confusion among names would lead to mop of gray heir both seller, and buyers of tires.